Today is the 7th day of what has seemed like one long unending day of build excitement from our Rally Fighter Build Team at LM, so I thought I'd share a few pictures of today's progress. Check the build page for more images. 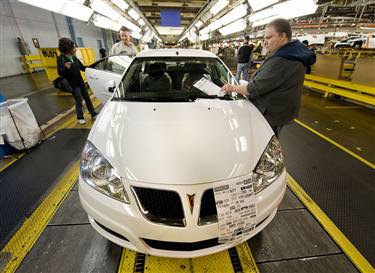 Some of the projects include, but are not limited to, applying wax for the flooring molds, bumper placement, body mounts, door linkage, and front lower control arms. Vegas (and the North American Southwest) better be ready! The headline pretty much says it all. We fired the engine for the first time just a few minutes ago. To accomplish something like this with even the simplest of engines without any major "gremlins" (electrical or otherwise) is a real feat in itself, but to do so with such a complex electrical system as the one we started out with from BMW and to determine all of the components needed and not needed to fire the engine is a major accomplishment. We can't fire the engine and let it run just yet because as you can see in the video, it's only mounted to our dolly that we use to move it around the shop, so once we get it mounted in the vehicle we'll fire it up and post some new pictures and video. Therefore, thanks have to go out to Steve and Oliver from ATG on delivering a stand-alone solution. 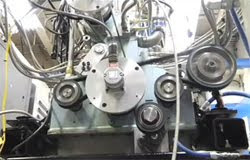 Congratulations also go out to Colby Whipple from the team here at LM for installing all of the accessories on the engine with little to no information. And of course congrats to veteran Factory Five builders/owners turned Local Motors Build Team members Henry and Steve for deciphering the complex bundle of wires, modules and junction boxes which to them was a sight unseen until they opened the box delivered by ATG. Their knowledge from previous builds was invaluable in making this happen today. The power of the community at work for sure! 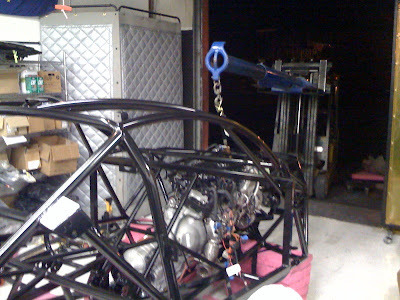 Now we need to get the engine and transmission into the chassis so we can run the engine. Here at LM we mark these monumental moments with a ring of the bell hanging in the office and a shout of "Great Success!" in our best Borat voice. Check out the picture of Henry and Steve as they join in on the tradition. Also check out the post firing pic of the team on hand for the day, (L to R) Dana, Ernie, Henry, Dave, Brian, Colby, Mike, Jay, Steve. A few images from late last night. 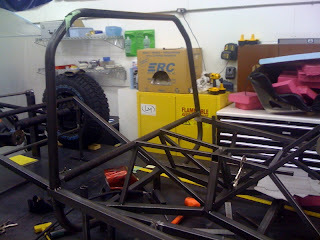 We set the body on the chassis for the first time last night, and IT FITS!!! Always a tense and exciting moment when this happens for the first time, especially since we developed this chassis and body a bit different than we're (Dave, Colby and myself) used to. Typically, we will develop the chassis in the computer as we're building it, and while that's happening, away from the chassis, the body is being shaped by hand, molds made, and a first article popped from the mold. 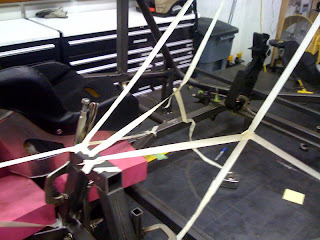 Once the chassis is mostly done (minus the roll cage), we will fit a body over it, and develop the bars to fit inside the body in physical space, then draw them on the computer. This time around (a more efficient and more accurate way in terms of having a production solution) we stuck our necks out quite a bit and did all of the design (body and chassis) in the computer, built the main chassis to completion here in Wareham, while the body patterns were milled on the West Coast, then a body made in Rhode Island (the next state over, about an hour away). 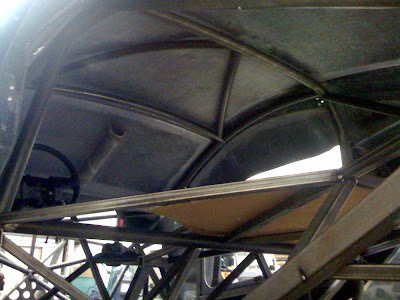 Also, I designed the roll cage using rolled tubes to fit along the curvature of the cockpit to allow more headroom and allow better fitment of interior panels, roof liners etc. 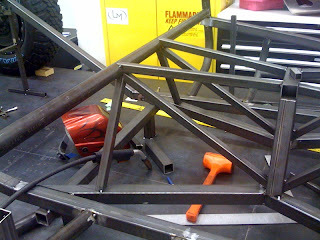 (and it looks cool) so that added to our apprehension when it came time to set the body on the chassis. Basically, we set it right on the chassis and it fit right away. Usually there are some tweaks that have to be made here and there and sometimes you get some serious interference...not this time. 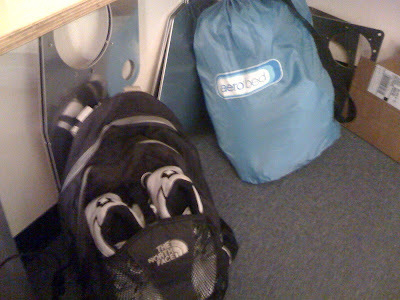 After that was done, we were all able to sleep much better (even though I slept in the office on the old aero bed to save the 2 hours I'd lose driving home to Boston, then back in the morning). 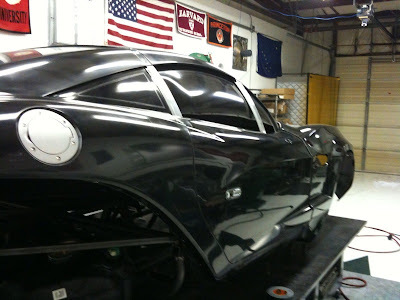 Here's an image of the Center Section (doors and windows not cut out yet), the Hood and the trunk that arrived today. These are part of the very first set of Rally Fighter panels ever produced, so needless to say, we're very excited and can't wait to mount them on the chassis which you can see in the background (Awaiting roll cage tubes, which are due to arrive in a few days from now). 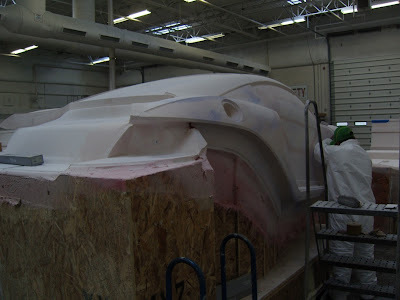 The panels have been trimmed using the scribes we designed into the molds, and both the hood and the trunk have the inner liners bonded to the outer skins. As you can see in the image, we couldn't help ourselves so Dave trimmed the body in a few places to install a few components like the tail lights, gas cap and the side vent. Stay tuned for more images of these panels and the carbon fiber panels which are also due to arrive soon. Also, there are more pictures from today posted on the Build Page, so check it out! Yesterday, we received most of the patterns and molds for the Rally Fighter. 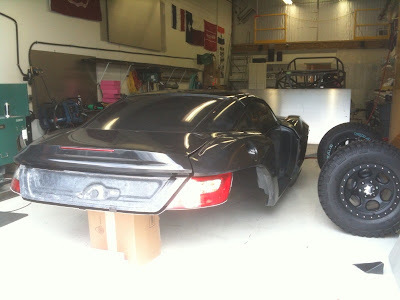 Also, when Dave met the truck driver delivering the molds/patterns at our body supplier, he was able to bring back the very first Rally Fighter Body panel, which you can see is the Driver Side front Quarter Panel. As expected, the panel is a high quality (although not Class A surface, it's pretty close) lightweight, sturdy piece. 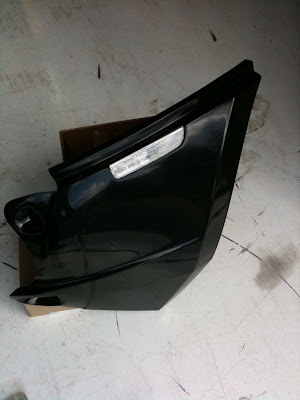 We set the side marker light in the panel to check fitment and it fits just as expected. Also, if you visit the Build Page, you can see that the center section mold was delivered and is also of a quality construction and matches the initial concept for the structure our supplier created. Check the build page for more pictures of these parts and stay tuned for many others! Recently, we received an email from Community Member Kevin Willey (TwoShoes) regarding a project he took on to make a shifter knob. "Recycling to the max? 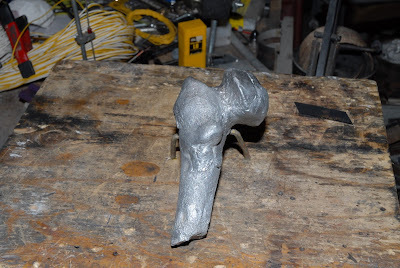 All the aluminum used in the casting was scrap from my shop. The smelter itself was made from an electric element from a discarded dishwasher, modified to fit tightly to the bottom half of a camp stove propane bottle. Heat retention blanket for the smelter was some old header wrap I had in the shop left over from another job. The casting method I used is called 'loss wax casting' except in this case I used pink insulation foam, retrieved from a local construction site, saved it from the land fill. I simply carve the master, coat it in drywall plaster and pour in the molten aluminum. The drywall plaster was about to be thrown out since it was too old and chunky to be used for drywall any longer. Even the power cord for the electric element was recycled. For a first casting it turned out fairly well, my method need some modification, however I am very happy with the result. Next up is a skull, going to be fun." 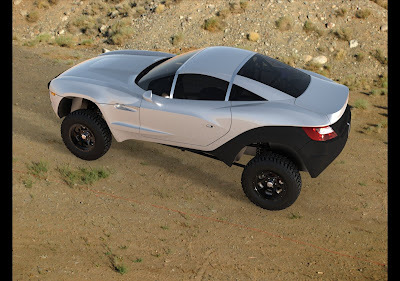 A big step in the process to making the Rally Fighter Body a reality has been completed. The hand finish work has been completed, and the pattern has been sprayed with Duratec surfacing primer, and polished as evident by the reflections from the shop lights. The surface is now ready to produce molds. 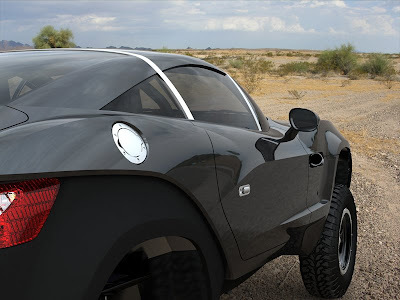 See the Rally Fighter Build Page for more pictures! 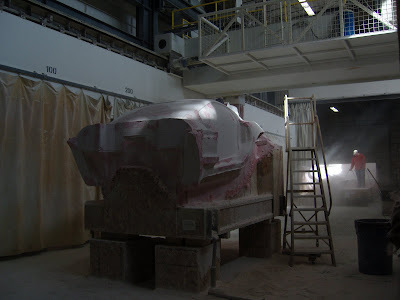 After the buck was built, the fiberglass was applied, and the milling compound packed on, the buck was positioned on the milling table for the inception of the rally fighter to commence. However, as the photos show, the pattern doesn't have the proper finish to generate a mold right from the mill. The surface will have to be refined by hand to remove the ridges left by the mill. 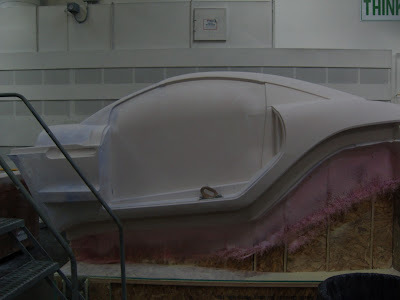 Once that is done, the pattern can then be used as a plug, over which fiberglass can be laid to create the molds. From that stage on, the plug will serve as the master pattern to create new molds as they deteriorate from pulling production parts. Stay tuned for updated photos on the center section once the pattern has been smoothed out and is then ready for the mold making process to begin. 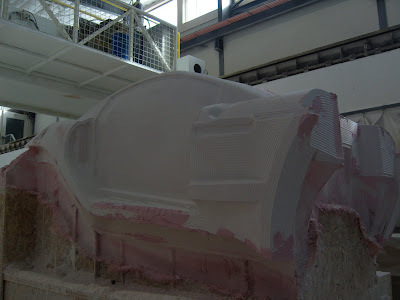 Recently, we've received some images from the company milling the body patterns and molds for the fiberglass components. This particular image is of the Rally Fighter center section, which was generated from the surface data/drawing previously posted on the build site. 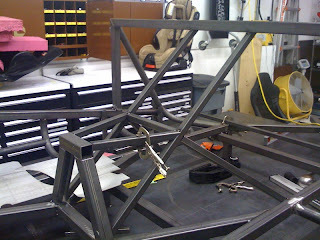 The structure is constructed of wood, then fiberglass is laid over the structure to keep it from flexing/shifting. After that, the proprietary milling material will be applied, then the shape will be milled. Pretty amazing to think that this structure at the size it is was made in just over one day. More images to follow as we receive them. After evaluating the placement of the tape in the physical chassis, I made some changes to the locations, took down the measurements and updated the CAD data. Using the Weldments function in SolidWorks makes this very easy since the tubing profiles are already loaded into the SolidWorks Library, which means all I have to do is draw the path that the tube will follow and select what profile I want. Therefore, once I was satisfied with the placement of the tape, all I had to do was drag the existing profile paths I had in the model to the determined locations...no redrawing cross sections and extruding, no changing cut angles, no inserting reference planes for the new tube location...all of this is generated by the software once I pick the profile path start and end point. These images show the development of the tunnel or "backbone" of the chassis. The tubes have been designed in SolidWorks first taking into account all of the components they will have to package and have been placed with passenger seating in mind. The tape you see in the pictures is a quick way we check the placement of those tubes to get perspective on the "feel" factor which you don't get in the computer. 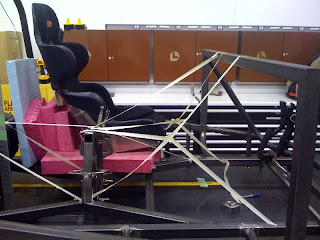 Therefore, I set a seat in the chassis using the H Point in the model as a reference to check the placement of the tubes/tape, how they affect seating, pedal placement etc., and will modify their locations accordingly. 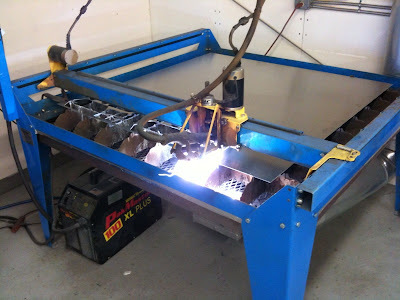 This is much faster than cutting sample tubes, tack welding them in place, re-cutting and moving as needed, then re-evaluating since I can put the tape down and pick it up and move it a number of times to get the right placement and then make the changes in the model before cutting the actual tubes. Farewell to the Voice of the Engineering Community! If you've been following the Vehicle Engineering Blog over the last few months, you'll know that our intern, Alex has been at the controls of the Blog. Or, maybe you didn't notice since Alex picked up right where I left off doing an excellent job continuing to educate and share knowledge of both the LM Engineer's most technical of advances and the simplest of duties in developing the Rally Fighter with equal ease and effectiveness. The same applies for many of the Rally Fighter Build Page posts, which Alex also shepherded through the sometimes turbulent trails of vehicle development. This is no easy feat for a first year engineering student, especially considering how quickly we move here at Local Motors. 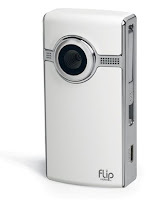 And if that wasn't enough, all of this was done under the scrutinizing eye of the online community. Furthermore, Alex was able to do so largely on his own and the blogs and build posts you've read were completely word-smithed by him with support coming mostly in the form of images to back up his points. Alex's last day was Friday, and he's moving on to enjoying the last bit of the summer on the Cape, running some races, and hopefully relaxing before returning to Northeastern University. As an NU Alum myself, I recall what it was like on my first co-op job and if I would have been able to step into an environment such as this as seamlessly as Alex ("A-Rod" as I jokingly called him) did. It was both a pleasure and a great asset to have him here in this crucial period in the development of both the Rally Fighter and Local Motors as a company, and we wish him well. Feel free to do the same by posting your comments here!